Our favorite times at the Pattaya Redemptorist School for the Blind are Sports’ Day and Teachers’/Benefactors’ Day; simply because the pageantry displays the sheer enjoyment the kids derive from music, dance and sport. Aurora Sribuapun, Director of the School, opened the ceremony for the latter event this past year with the following introduction: “On behalf of the School for the Blind under the royal patronage of her Royal Highness Princess Maha Chakri Sirindhorn, I welcome you all here on the Teachers’ and Benefactors’ Day. 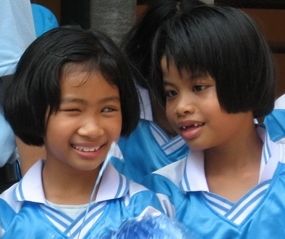 There are only 11 facilities in Thailand for the visually handicapped and the School for the Blind in Naklua is one such institution that offers education from 1st year kindergarten to the ninth grade, as well as boarding, vocational training and special care for blind and mentally impaired children. However, the Redemptorists claim that over 96% of the blind people in Thailand still have not been given the opportunity to get an education. Khun Aurora, who is also blind, and has a master’s degree in special education for the unsighted, helped initiate the School for the Blind with the late Father Ray Brennan back in 1986. The school moved to their present location in Naklua on Soi 16 about a half kilometer from Wat Po off the Pattaya-Naklua Road in 1992. Presently the School for the Blind is part of the Father Ray Foundation, which also includes the School for the Disabled, Children’s Home, Outreach Work Center, Children’s Village and Day Care Center. Khun Aurora makes it perfectly clear that their goal is to educate the kids so that they are not ‘a burden on society’. While some blind students aspire to go to university, many just want a high school education so they can earn a basic living. When a student turns 18 he or she should be ready for the next step, which hopefully is finding a niche in the world of employment. It is also important for the older students to move on to make room for younger candidates awaiting admittance. The list of children waiting for spaces to open at the school is endless as well. Despite the fact that they are full, there always seems to be ‘special cases’ that need immediate assistance and are readily admitted. Khun Aurora admits that there are some ‘special cases’ involving young adults where mental impairment is also an issue and finding a useful place in society is unlikely. For these persons there are special homes in Bang Prakong, Papa Daeng (Samut Prakhan) and Nonthaburi, where they can reside indefinitely. Still others can return to their families and qualify for special pensions from the government. The Disabled Persons Act requires companies of 200 employees or more to employ at least one handicapped person. She adds that blind persons can work in the hotel industry answering phones, making bookings, translating languages, etc., while partially sighted individuals can be porters, waiters/waitresses and/or work in laundry. She acknowledges that one of the biggest demands for blind people is in the capacity of masseurs or masseuses, who are also qualified to diagnose ailments through their art of touch. * In 2002, we provided 200,000 baht from Paul Baker’s Farewell Sponsored Push Bike Ride for the purchase of a variety of essential supplies including desks, chairs, storage cabinets, etc. * In 2003, the Standard Chartered Bank joined us and donated 100,000 baht, specifically to the School for the Blind as part of their ‘Seeing is Believing’ campaign. These funds went for the purchase of additional tables and chairs for the 200 plus students, as well as musical instruments for the band and choir. * In 2004 and 2005, we continued to provide educational aids and supplies and made some structural repairs to the buildings, totaling 181,000 baht. * In 2006, we supplied furniture and appliances for the Father Ray Home, an independent living project for teen-agers, so they could experience a real life social environment. We also provided bunk beds and bedding material for the students in the dormitories. Total cost: 406,000. 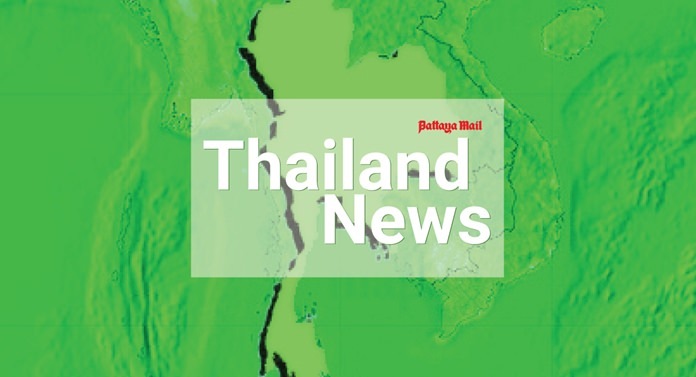 * In 2007, 245,730 baht went for educational materials, sports uniforms and equipment, computer hardware and Zegrain protein supplement. * In 2008, we supplied 280,000 baht for medical supplements and renovation and repair of the roof over the sports facility. * In 2009, we did a major upgrade to their main water system, including the purchase of industrial pumps to get water to the top floors. We also built a new office for them next to the front gate, so that the old office could be converted into another classroom. We also paid for specialized footballs with pebbles inside them so the athletes could locate them during play. Total given: 408,440 baht. * In 2010, we furnished the new office with air conditioners for 90,000 baht. * In 2011, 110,000 baht was provided for medical supplements and a drinking water system across the street at the vocational training center. * Total donated to date: 2,021,170 baht. Supporting blind children has been important to us, as well as other special education schools assisting the disabled. We plan to stay the course with the School for the Blind and we hope you will join in too. Khun Aurora asks us all, if you see a blind child on the streets, please encourage his or her family to enroll the child in their school.